UPDATE: The Las Vegas Metropolitan Police Department has released almost 20 additional body-cam videos and 35 audio files of police transmissions associated with the mass shooting on Oct. 1, 2017. The video that was released today is very similar to what has been released before. Much of the video shows police officers arriving on scene while gunshots can still be heard and directing people to get away from the venue or telling them where to seek medical help or helping people to waiting ambulances. One clip shows police officers gathering on Las Vegas Boulevard across from Mandalay Bay. Gunshots can still be heard and the officers are trying to figure out what to do next when one of the officers, who has been identified as police officer Brady Cook, is shot in the arm. Another officer responds to his yells about being shot and puts a tourniquet on the officer. The two officers then begin running towards where they believe they can find medical help. Eventually the officer wearing the body cam jumps into a patrol car with the injured officer and begins driving towards a hospital. During the car ride, the officer begins asking the injured officer a series of questions to make sure he stays conscious. WARNING: THIS VIDEO HAS ONLY BEEN EDITED FOR LENGTH. YOU WILL HEAR GUNSHOTS AND YOU WILL SEE SOME BLOOD FROM WHERE THE POLICE OFFICER WAS SHOT. THIS RAW VIDEO MAY BE DIFFICULT FOR SOME PEOPLE TO WATCH. Another lengthy video shows a police officer who has just arrived at the scene while the crowd is still being fired upon. He is quickly surrounded by many gunshot victims and begins calling for medical help over his radio. The video shows other people helping those who have been shot, including an off-duty paramedic who identifies himself to the police officer and tells him that he has triaged several people. Other video released today appears to show Las Vegas police officers inside the Mandalay Bay security office when the shooting began. The police officers begin to hurry out of the hotel-casino with security guards when they heard something that caused them to make an abrupt turn. They sprint to the elevators and head to the 31st floor. 13 Action News has chosen not to broadcast much of the video and 911 calls that they have received out of respect for the victims and their families. Much of what we have received is very graphic in nature. 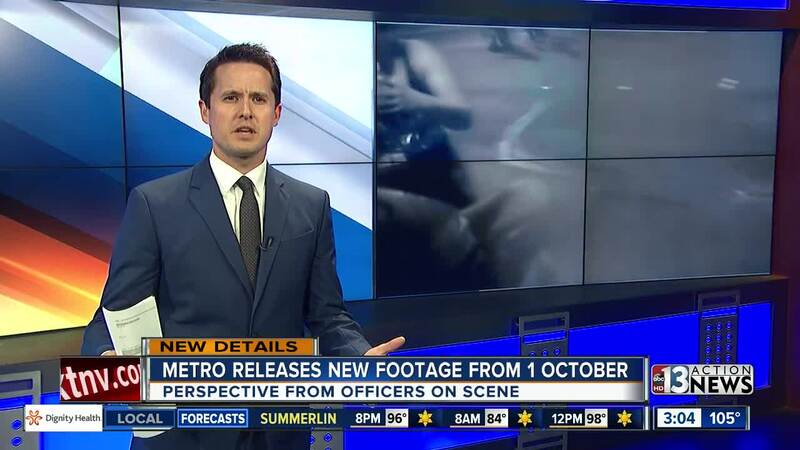 13 Action News was part of a lawsuit that eventually forced the Las Vegas Metropolitan Police Department to begin the release of all the materials gathered during the course of their investigation. All of the material is being reviewed by a team of reporters and editors at the television station. Another batch of material will be released next Tuesday. Weekly releases are expected for quite some time. 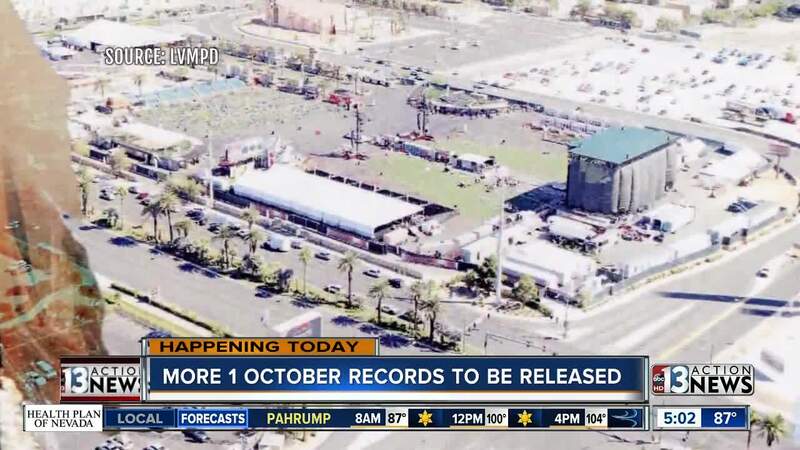 Las Vegas police expected to release more material related to the 1 October mass shooting at noon today. Last week's release featured 24 video files and 130 audio files from the night of the mass shooting. The mass shooting on Oct. 1, 2017, during the Route 91 Harvest festival on the Las Vegas Strip claimed the lives of 58 people. Hundreds more were injured. 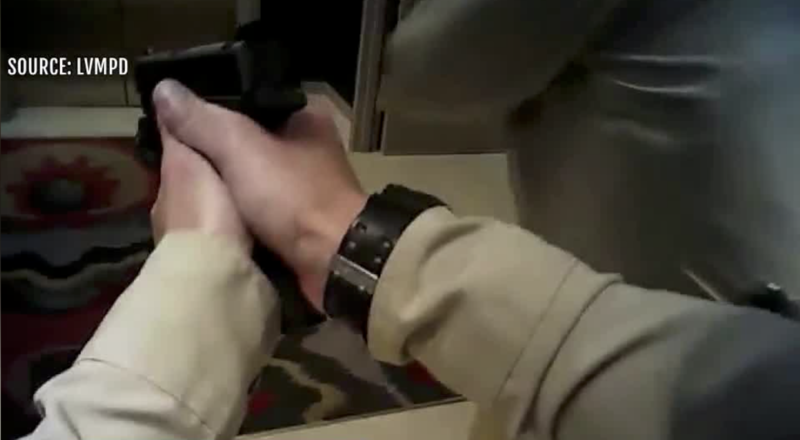 The Las Vegas police department has been releasing documents, body cam footage and audio files (911 calls) for the past several weeks after being order to do so by the Nevada Supreme Court.